I'm assisting my boss today in interviewing candidates for a position within our Department so wanted to look professional but not "starchy". My outfit actually started with this new patterned silk shell that I bought last week. I've been needing some sleeveless layering pieces to pop underneath my solid coloured blazers - sleeveless so that when that demon menopausal hot flush hits me, I can whip off my jacket in a sweaty frenzy and still look put together and well covered. This shell has a blush background and then a jewelled pattern in jewel tones - emerald green, purple, cobalt, etc. 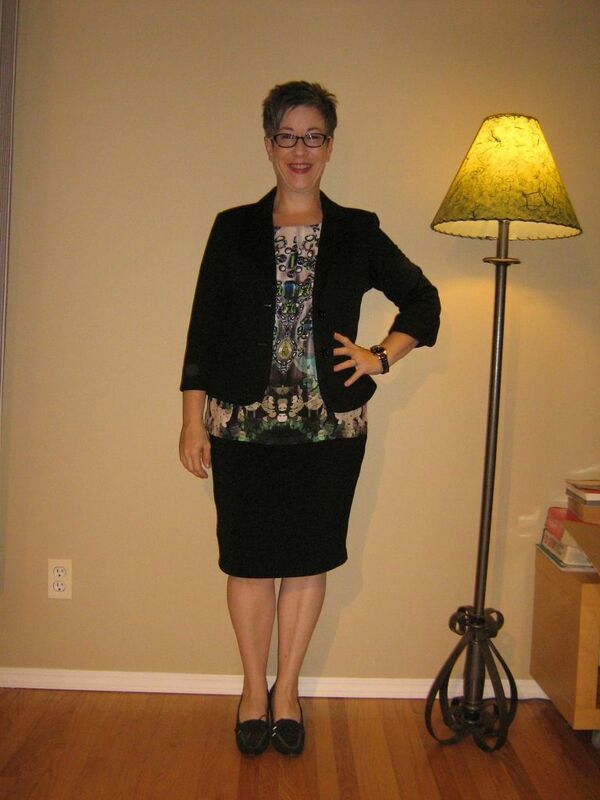 I paired the shell with my knit black pencil skirt and blazer. Although I like the comfort and softness of the knit blazer, I have come to realize that knit blazers do not have enough structure for me - they don't nip in my waist at all - so will be watching for a more structured black blazer in the next little while. However, this will do for now. I added my mossy green heeled pumps for footwear and my blush clutch for my handbag. I bought this clutch for my son's graduation dinner and more dressy events, but decided it could work in a daytime setting too. My rose gold/black watch and gold wedding band round out the outfit. What do you think? Professional but soft and approachable? As always, all comments/suggestions welcome. P.S. got my hair cut Saturday and decided to go back to a bit shorter. I've kept the side swept fringe but decided that I feel so much more like ME in a shorter, funkier hair style. I really like how Ceit paired the CM floral moto with purple earlier in the week and how Diana has been rocking her bootleg jeans lately - so decided to copy both of them! I started the outfit with these old jeans of mine - they are not true bootcut (those are on my shopping list now) and are more of a trouser jean but they are the closest I have and not only do they fit again, they are bordering on too big! I then added a dark purple tank and topped that with the floral moto. Ceit is right - the purple seems to really bring out the colours and tones in the jacket. I finished off the outfit with my dark blue/purple suede booties and my light cream handbag. So what do you think? A good combination for Friday Denim Day at work? As always, all comments/suggestions welcome. I knew when I read Angie's blog post on how to wear ankle length pants with ankle strap footwear (http://youlookfab.com/2013/09/.....rap-shoes/) that I would need to give this a "go". I had already purchased these pieces but hadn't thought about rolling the hem of the pants until I saw Angie's beautiful outfit. 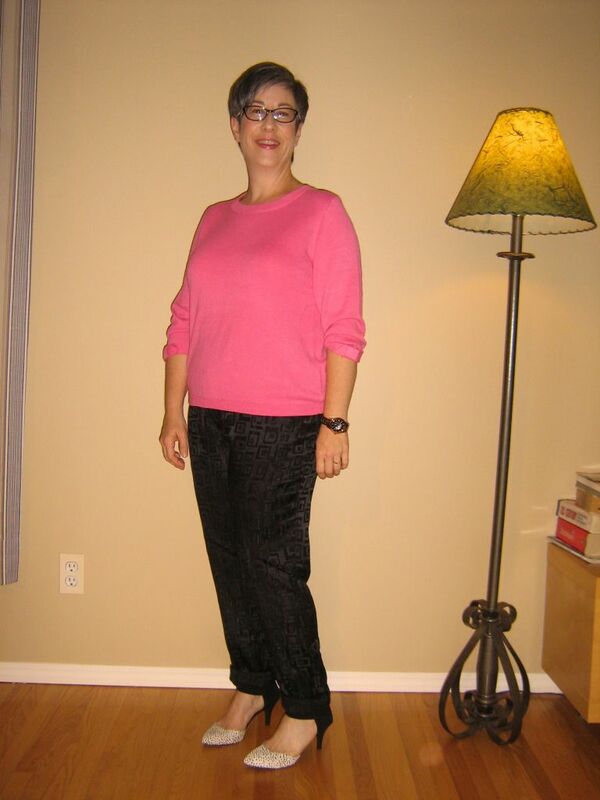 I started today's outfit with these recently purchased black-on-black patterned/textured silky pants. I love how these are only slightly slouchy as I'm kind of over wearing the super slouchy look (on me anyway) and how the texture makes the pants more interesting than just plain black. They are full length with a bit of scrunch normally but as per the formula, I rolled them twice to create ankle length. I then added my new ankle strap black and white heels. They are 2 inches so quite comfortable for my knee and because the two box doesn't cut across where my bunion is and is quite wide for a somewhat pointy toe, EXTREMELY comfortable! I then added my pink knit pullover for some bright colour contrast and my snakeskin print oversized clutch. Jewelry is my gold wedding band and my rose gold/black watch. Have I demonstrated the ankle strap formula correctly here? Does it all work together? As always, all comments/suggestions welcome. If I remember correctly, Angie has commented recently that jackets shaped like the Theory Lanai jacket work well on women with shorter necks, fuller busts and apple shapes. This was discussed a fair bit with respect to the Halogen taupe leather cut-away jacket featured in Angie's NAS picks. It's all related to being able to "fill out the jacket". Let me see....shorter neck? Check. Fuller bust? Check. Apple shape? Check. So does this mean that in theory (pun totally intended) the Lanai jacket is my "perfect shaped" jacket? I can already tell my recently purchased animal print pencil skirt is going to be a favourite and a workhorse. 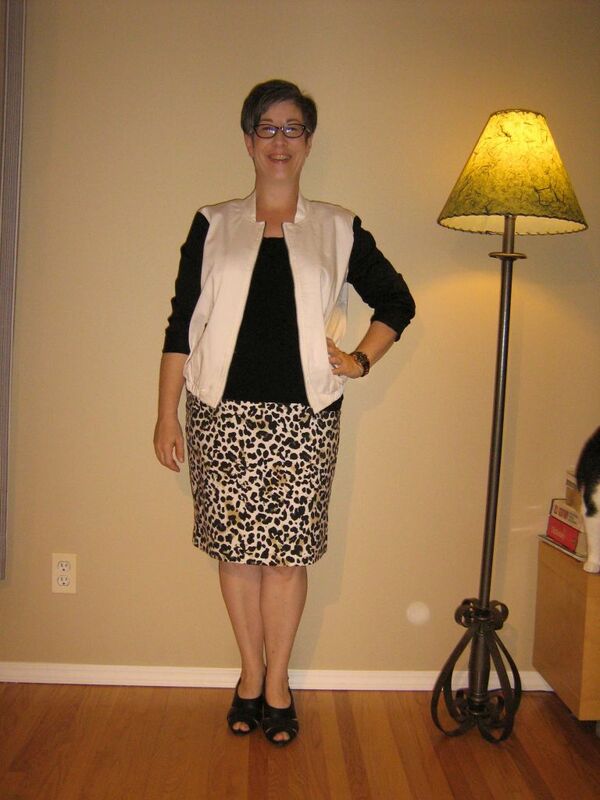 MaryK is right - animal print goes with everything! So what do you think? Does it all work together? As always all comments/suggestions welcome. This dress reminds me of the VC striped tube skirt - just with a top attached! It may be officially Autumn, but you'd never know it by our weather right now. Yesterday we got up to +27 Celcius and it's going to be hot again today and in the mid 20's all week. So today's outfit is dictated by the weather but hopefully still looks seasonally appropriate. 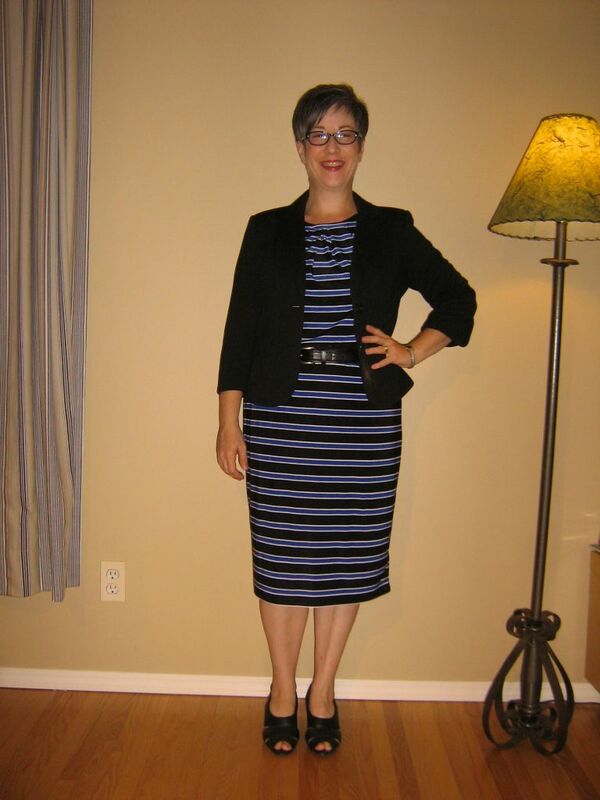 I started with my cobalt/black/white striped sleeveless dress and topped it with a fairly light knit black blazer with 3/4 length sleeves. For footwear, I chose my trusty black Clarks sandals and am carrying my cobalt/cream quilted handbag. Jewelry is my silver wedding band and silver bracelet watch. Does this work for a hot Autumn day? As always, all comments/suggestions welcome. Today is the debut of two new items, as well as the welcoming back of a favourite item. First new item is the straight leg, dark wash jeans - I wanted a slightly dressier jean to wear to Denim Day at work (to rotate with my more casual TR Camerons). I wanted no embellishment, coloured stitching, whiskering or fading and these DKNY fit the bill. I've paired the jeans with a mixed media army green and camo pull over. 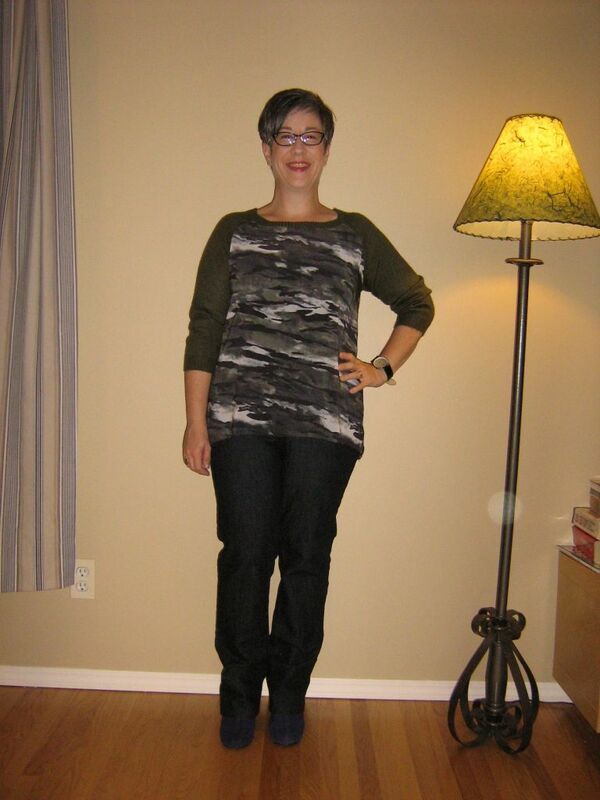 The front is a drapey camo print and the sleeves and back are an army green knit. It also has a hi-low hemline. I had these jeans hemmed to work with all my booties (red Sam Edelman, blue suede Aerosole, black patent Ara). Luckily all of these booties have the same heel height so this will make the jeans even more versatile. Like Angie, I have figured out that I need to pick a heel height for hemming and stick with it. So today's booties are my dark blue suede Aerosoles - oh so comfy! And then to pick up on the white in the camo print, when I step outside I will have on my white leather jacket. I've been waiting less than patiently for it to be cool enough to pull out this favourite. I'm carrying my light cream handbag and jewelry is my black/white oversized watch and silver wedding band. So what do you think? Jeans and top good choices? As always, all comments/suggestions welcome. It's funny how I struggled with styling this full green midi skirt but now that I've figured out that I need the top half of me to have structure, I'm loving it! So I started out today with this twirly green midi (which is beautiful in motion) and paired it with a black tank. 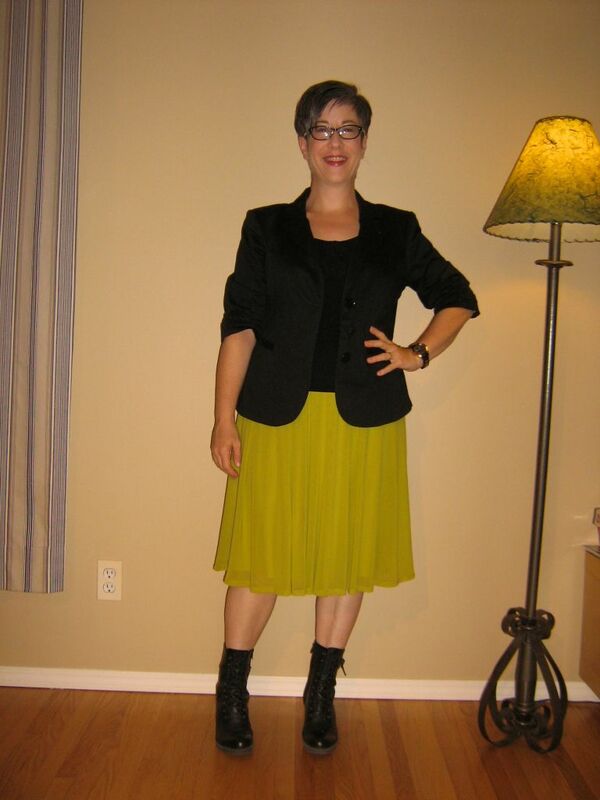 On top of that I added my black ruched sleeve blazer. I know not everyone cares for pre-ruched sleeves but I quite like it on this blazer. For footwear I decided to go with my Doc Marcie mid calf boots - love the juxtaposition of a more rugged boot with a girly skirt. I chose my over sized snakeskin print clutch for my handbag and jewelry is my gold wedding band and rose gold/black oversized watch. Happiness factor? Off the charts. I always feel so like ME when I put on these Docs. Anyway, over to you...do you think it all works together? As always, all comments/suggestions welcome. BTW Gain thinks a morning treat is in order while Dusty Bottom is more refined in his "begging". As you know, I've been on the hunt for a white silky, slouchy blouse for fall/winter. But I'm beginning to wonder if this is an elusive beast and more importantly, if it's actually the style direction I'm heading in. On the weekend, trying on ALL of my fall/winter items (I purge ill fitting, unwanted items at the beginning of each season), I'm not feeling the slouchy love as much as I used to. Although I still love a good menswear-inspired outfit, I'm not wanting as much slouch as before. In fact, I have purged my Sears black and tweed slouchy trousers (WAAAAAAAY too big now as they were big to begin with) and have my Lord & Taylor Wonder Woman transpired slouchy trousers in the holding zone. I seem to be feeling a bit more of a tailored vibe lately - not tight but not slouchy. So this has led me to think that perhaps I would prefer a bit more of a tailored white shirt than a slouchy one. I wouldn't go so far as to say I want a crisp white shirt, but almost something in between, if that's possible. 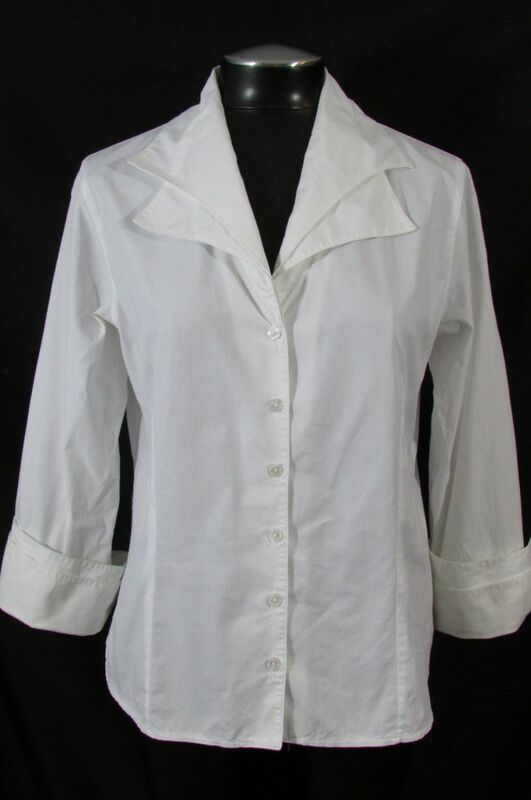 Since I have put myself on a strict shopping budget, I have been scouring eBay and have found a lovely Anne Fontaine shirt at a very reasonable price. 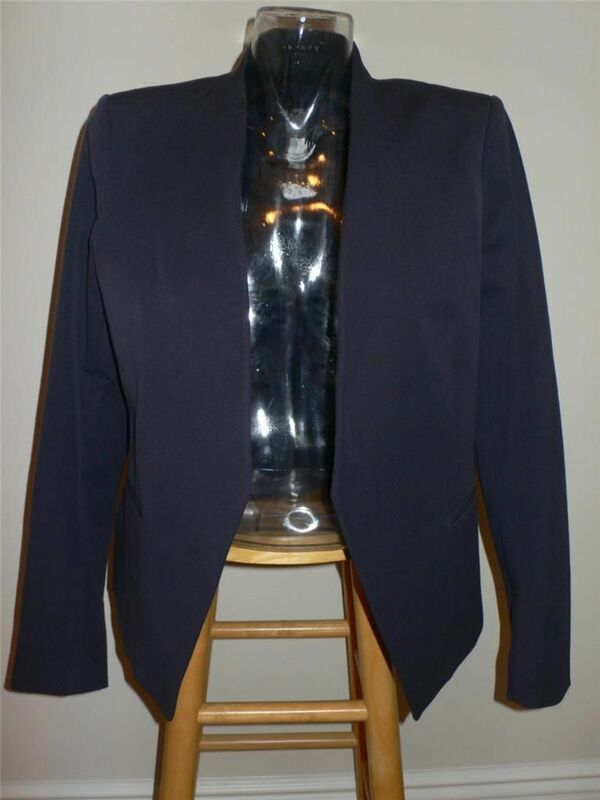 In fact, this might be the one that Natalie has with the double collar and double cuffs. I checked the conversion chart so know that the European size listed corresponds with my U.S. size but am just wondering if Anne Fontaine shirts run TTS? Here's a pic of the shirt BTW. The seller does offer inexpensive shipping and full returns so there's not really any risk involved. Also, do you think this type of shirt could work with my style? Angie has convinced many Fabbers that white after Labour Day is not a sin. So I'm wearing white jeans today and am proud of it! I've paired my sized up skinnies (which are now very loose at the waist - thank goodness for belts!) 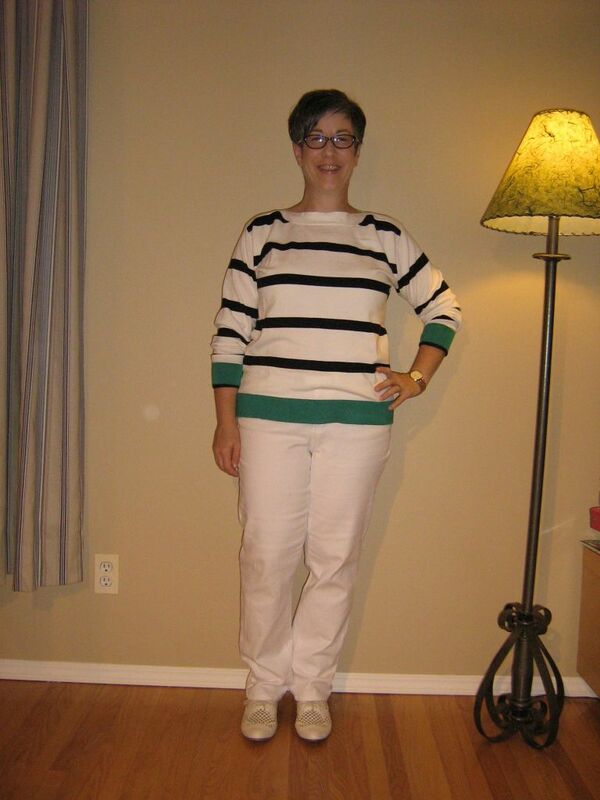 with my newly thrifted white and navy striped boat neck pull over. I love that the cuffs and bottom band are teal green - it's something a little unexpected. I am also liking the boat neck - for someone with quite narrow and sloping shoulders, I find this horizontal type neckline gives my shoulders a bit more visual width. For footwear I chose my cream laser cut oxfords and am using my cobalt/cream handbag that I also used yesterday. Jewelry is my gold watch and wedding band. How does this look for a September day? My one concern is whether or not the shoes are too summery? 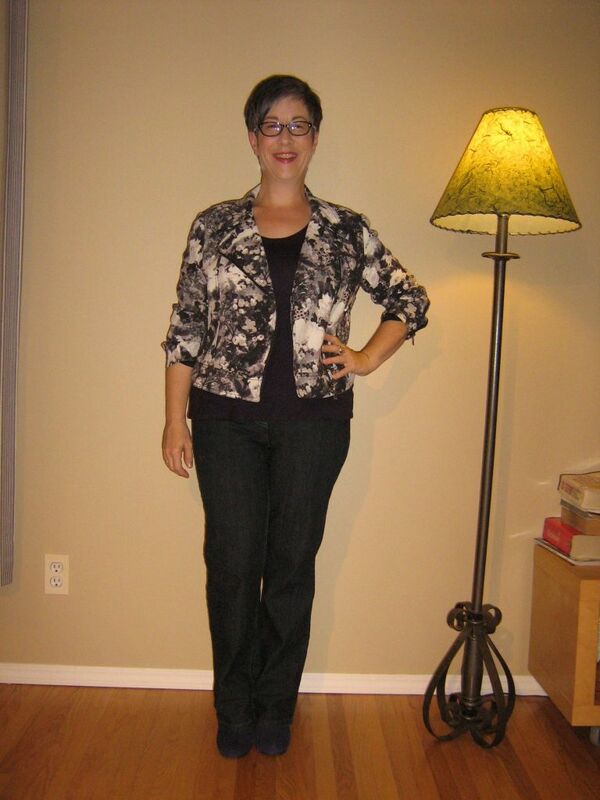 I also tried the outfit with my beige suede Toms wedge booties and liked that look as well. So I did end up changing my light footwear to my beige suede Toms before I left the house and I feel more "fall-ish" as a result. I felt with the cream oxfords that the whole outfit was a bit too light. The Toms feel more grounded. Kristin took a quick pic in the office - what do you think?